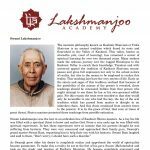 In the summer of 1980 Swami Lakshmanjoo gave a series of lectures on “Practice and Discipline in Kashmir Shaivism.” These lectures, given in Kashmiri language, were later translated into English and published in the book, “Self realization in Kashmir Shaivism”. In his talk on Discipline, Swamiji followed the traditional interpretation of the Yamas (observances) and Niyamas (rules and regulations) as set out by Patanjali in his Yoga Darshana also known as the Yoga Sutras. 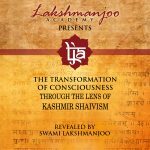 It should be noted, that Kashmir Shaivism has a uniquely different approach to the eight limbs of Yoga (ashtanga yoga) than that outlined by Patanjali. In Trika Shaivism pranayama, pratyahara, dhyana and dharana are considered to be external ways of maintaining the strength of yoga. There is only one predominant limb of yoga that is “tarka.” Tarka means ‘perception which differentiates’. It is discriminating, transcendental logic. This fifth limb of yoga is the discrimination between individual and universal, i.e. discriminating logic and reasoning from within your own consciousness. and the niyama of Ishvara Pranidana (devotion to Lord Shiva). The following is an extract from the talk given in 1980. Ahimsa means non-violence and this non-violence is of two kinds – subtle and predominant. Subtle non-violence is that wherein the effects of one’s actions or words are taken into account. It is also violence if your words or actions harm another psyche, or cause anger or hatred in another. This kind of violence is subtle in nature. You should be humble and soft spoken. You should discipline yourself to prohibit yourself from inflicting subtle pain, which though latent, is painful. Maintaining this subtle non-violence does not permit you to deal with others in a loud and shrill manner. This subtle non-violence must be followed through a strict discipline of body, mind, and soul. One who maintains and is established in this discipline of subtle non-violence in body, mind and soul, influences all mutual enemies by his presence. Such is his vibrating power. these creatures in the presence of a person or spiritual aspirant who is established in the discipline of non-violence. Predominant non-violence is the shunning of that which is the worst of all violence, i.e. the killing or taking of life of a living being for the pleasure of eating it’s flesh. There is no greater sin than this. To be really established in non-violence you must leave meat eating, you must shun it completely, you must be a complete vegetarian. It is a fact that the fruit of meditation can only be possessed by a pure vegetarian. All those involved in any way with the acts of killing, preparing, and eating meat are equally guilty and equally depraved and criminal. Every aspect of this act is wrong. Even those who witness the act of killing, or witness the act of eating meat are criminals. I cannot impress upon you strongly enough how sinful and wrong is the act of eating meat. The butcher, the cook and the final consumer–even the witness of any of these acts–are all sinners. terrible, violent act of killing. Take one small piece of meat and you are just like the butcher himself–you both belong to the same class. About this there is no doubt. Even if you may be a vegetarian and do not oppose this act of extreme violence, or do not denounce this horrible act, you are a sinner judged to have committed the same crime. A person who maintains friendly contact and is sociable with butchers, though he is a vegetarian, is also a sinner and receives punishment. So it is your duty not only to maintain a strict vegetarian lifestyle, but also to loudly oppose the killing of animals and the taking of meat. You must communicate my message and this truth to everyone who is near and dear to you, mothers and fathers, sons and daughters, and all your relatives. These crimes are prana-harana, pida, and virya-kshepa. Prana-haranais the crime of taking life away from an animal though it is innocent and has done nothing to deserve having its life taken away. Pida is the crime of inflicting great pain on an animal while killing it, and virya-kshepa is the crime of taking away its strength. A person performs an Ashvamedha sacrifice every year for his whole life, how virtuous and sinless he must be. Yet that person who only abstains from eating meat is higher, more sin-less, more virtuous than he who performs the yearly Ashvamedha sacrifice. You should not serve meat on marriage occasions, nor should you fool yourself into thinking that you must take meat for reasons of health. This is no reason. Why should you kill or take the life of an innocent being because of your disbelief and fear of death. It is better to die then to try and preserve your own life by taking the life of an innocent being. danger or fear.” I say, “this is all nonsense, irrelevant and meaningless.” Even my father went to Khrew Shrine and worshipped by offering the lungs of sheep. Hence do not eat meat. This is real non-violence (ahimsa). Ishvara pranidhana is the final and supreme niyama. It means love and devotion to God. The love of Lord Shiva creates devotion. If you love Lord Shiva and are devoted to Him it is not possible for Him to neglect you. He will reveal Himself to you and purify you with his glorious eighteen arms, helping you to enter into the realm of God Consciousness. 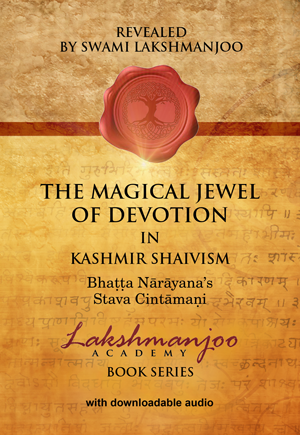 Swami Lakshmanjoo concluded the series of lectures by saying, “If you follow what I have said meticulously, there is no question that Lord Shiva in the form of Svacchandanatha will protect you with His wonderful eighteen arms and, through His shinning Grace, reveal Himself to you.